INVISIO’s systems address the modern soldier’s challenges of mobility and sustainability by simplifying and reducing the burden. The INVISIO tactical communications and hearing protection systems are targeted for military and security personnel. Today’s soldiers demand tailored and off the shelf solutions with significant functionality and features. Depending on their role and the mission, the professional user requires between one to three communication devices. The INVISIO product range incorporates control units designed to meet these requirements which are interchangeable and include plug and play flexibility. The newest addition to the system is the INVISIO V20, the smallest and lightest control unit available. Designed with 2 PTT buttons, it is designed for soldiers with a single radio, for one or two talk-groups. “We are broadening our range of control units to meet the mission specific user requirements, by adding simpler, smaller and lighter control units to the portfolio. The modern soldier requires anywhere from one to three communication devices, depending on their role and needs. With the launch of the INVISIO V20, we now have the product range to cover all these requirements”, says George Nicolakis, Director Product Management, INVISIO. The new control unit powers from the radio, diminishing the system’s complexity and is fully compatible with other INVISIO systems. Combined with the market leading INVISIO X5 in-ear headset, the INVISIO V20 offers a state-of-the-art level of hearing protection whilst allowing the user to communicate and maintain a natural level of auditory situational awareness. INVISIO V20 comes with a single Com Port and weighs as little as 99 grams, therefore is very intuitive and simple to use. As with all the other INVISIO control units, the INVISIO V20 can connect to different radios, intercom systems, mobile phones, computers, remote PTT or power supplies. Either way, the system will automatically sense it and change the settings. 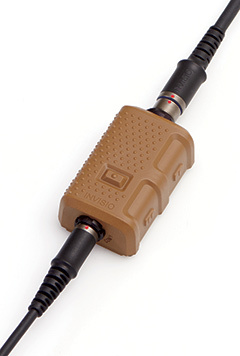 With two PTT buttons, the INVISIO V20 offers a rugged design with immersion to 20 meters.